Kyle Busch Motorsports announced Wednesday that Todd Gilliland will drive the No. 4 Toyota in 19 races this year in the NASCAR Camping World Truck Series. The rest of the driver lineup for the No. 4 team, which carried Christopher Bell to the series championship last year, includes team owner Kyle Busch for two races (Atlanta, Kansas) and Gilliland’s father, David, for the season opener at Daytona International Speedway. The team indicated it would announce a driver for the March 2 race at Las Vegas at a later date. Marcus Richmond will serve as the team’s crew chief. Gilliland, 17, will compete for Sunoco Rookie of the Year honors. A NASCAR rule that prevents drivers younger than 18 from competing on tracks greater than 1.25 miles will force him to miss four races early in the year. He is scheduled to race at .526-mile Martinsville Speedway on March 24, then Dover International Speedway on May 4 before joining the remainder of the schedule at Charlotte Motor Speedway shortly after his 18th birthday on May 15. 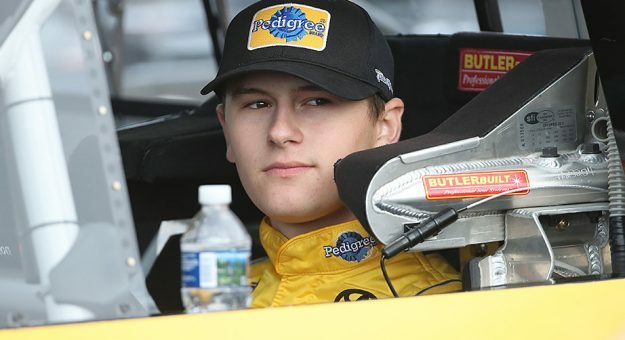 Todd Gilliland, a member of the NASCAR Next youth initiative, competed in six Truck Series races last year with a best finish of third place in September at New Hampshire. He also won the NASCAR K&N Pro Series West championship last year with six victories in the 14-race season. David Gilliland, 41, last competed in the NASCAR Camping World Truck Series in 2015 with a seven-race stint for team owner Ricky Benton. He is a veteran of 332 starts in the Monster Energy NASCAR Cup Series with three career pole positions. Busch, the 2015 Monster Energy Series champion, scored three victories in a seven-race Truck Series schedule last season. The team indicated it would announce sponsorship at a later date.